Annually, KIR Foundation organizes an End of Year Event. 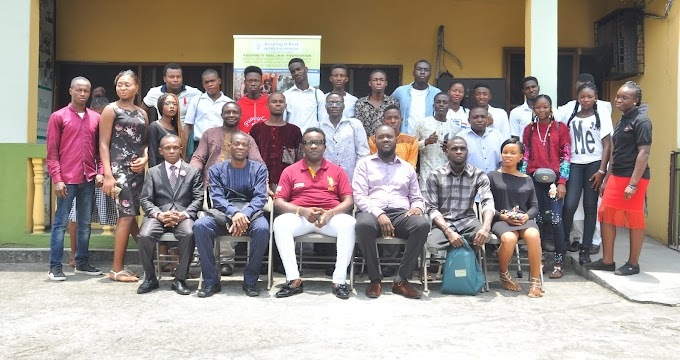 Also, this year, we are having the End of Year Event Together with the Graduation of 50 Trainees who participated in a one-month training program on Basic ICT Appreciation and Computer Maintenance and Hardware Repairs for the Niger Delta Youth Employment Pathways Program funded by PIND Foundation and implemented by KIR Foundation. The objective of End of Year Event is to share the stories of how donations from our donors have transformed the lives of our beneficiaries in the fiscal year; create awareness of our programs to raise funding from more donors and organizations. Also, items produced by the beneficiaries of KIR Foundation during our Vocational training initiatives are displayed and sold, so that our beneficiaries are encouraged to be self-reliant. Furthermore, we raise funds through the sale of exhibition stands and organize a raffle draw to implement a specific project. One of the major barriers to quality education in Nigeria is the lack of books. 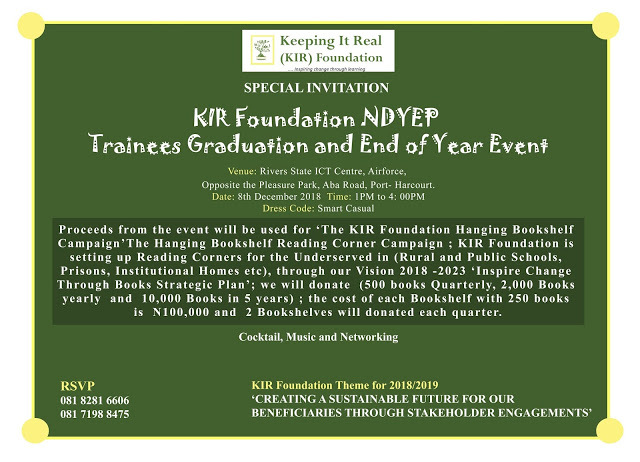 The proceeds from the KIR Foundation Annual Event 2018 will be used for ‘Hanging Bookshelf Reading Corner Campaign’ – KIR Foundation is setting up Reading Corners for the Underserved in (Rural and Public Schools, Prisons, Institutional Homes etc) through our Vision 2018 -2023 ‘Inspire Change Through Books Strategic Plan’, (500 books Quarterly, 2,000 Books yearly and 10,000 Books in 5 years), (Cost of each Bookshelf with 250 books, N100k, 2 Bookshelves will be donated each quarter). We will be most grateful if you or your organization; could partner with KIR Foundation by contributing to the End of Year Event by investing in our ‘Hanging Bookshelf Reading Corner Campaign by sponsoring one Reading Corner or by paying for one of the items on the budget and / or donating gifts (branded souvenirs) for the raffle draw. Venue: Techcreek Rivers State ICT centre, Airforce Road, Opp the pleasure park, Port Harcourt. We urge you to continue with us on this journey of transforming the lives of our beneficiaries who have not only increased in number, but have grown in their capacities and capabilities because of your sacrificial investment.